Sometimes when you have too many books you forgot what you’ve bought only to find one lying about later. Such was the case with At All Costs-Stories of Impossible Victories by British historian Bryan Perrett. I had purchased the book at a used book store and laid it on the shelf and forgot about it until recently. What a shame, because it’s a gem. One of the stories is titled, The Walls of Delhi 1857. The story is about the Indian Mutiny and a British\Indian army called the Delhi Field Force sent to retake the key City of Delhi from the mutineers. One of the remarkable features of the book is that Perrett is able to give the strategic background for each battle, thus explaining what happened prior to the impossible victory he documents so well. The catalyst for the Indian Mutiny (1857-59) was a rumor that the cartridges for the Enfield Rifle were coated in the grease made from cows and pigs. This offended both the Hindu and Moslem Sepoys (soldiers) primarily in the Bengal Army and they revolted. 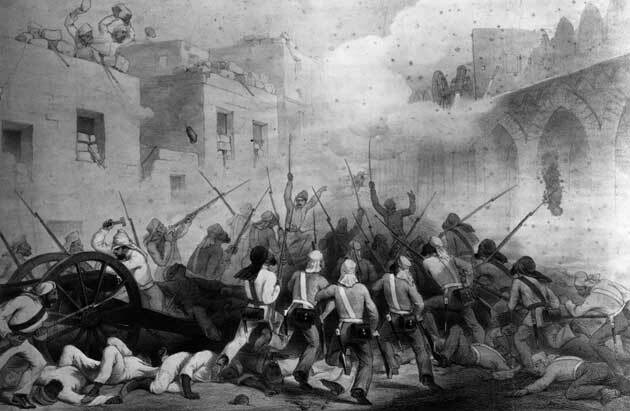 The revolt started in the City of Meerut. The Indian Regiments in Meerut refused to stand down for discipline, (not accepting the cartridges) murdered their officers and killed every British soldier and their wives and children they could get their hands on. The revolt soon spread to Delhi where the same kind of atrocities were carried out by the mutineers. The Delhi Field Force was stationed 130 miles north of Delhi and was commanded by General Sir George Anson. Anson’s intent was to recapture Delhi from the mutineers with his small force consisting of the Ninth Lancers (British), the 75th Gordon Highlanders, two troops of Royal Artillery, two European Bengal infantry regiments, and two native regiments, one of which joined the mutineers while the other was promptly disarmed. 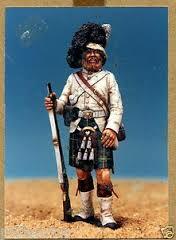 Model figure of a Gordon Highlander during the Indian Mutiny. The traditional red tunic has been done away with due to the heat in India. It was not a large force that Anson had at his disposal. To make matters worse the General was elderly having last seen action at Waterloo in 1815. As it were Anson died of cholera shortly after organizing the relief force. The force passed into the hands of General Sir Henry Barnard. The relief force was then joined by the remnants of the garrison of Meerut consisting of two squadrons of the 6th Dragoon Guards, part of the 60th Rifles (British) some loyal East India Company Cavalry and seven artillery pieces. With this combined small force of about 4,000 men General Barnard set out for Delhi. The British had revenge in their hearts for the atrocities committed against their murdered wives and children. It filled them with zeal and when blocked by 30,000 mutineers they did not hesitate to attack thus routing the mutineers who fled back to Delhi and the safety of its walls. The battle was a remarkable achievement of the few against the many but more was yet to come. The relief force reached Delhi and occupied a ridge over looking the city thus creating an absurd situation where 4000 men were besieging 30,000 mutineers behind the considerable defenses of Delhi. The mutineers were commanded by Bakht Khan an Indian Artillery officer with 40 years experience. Taking Delhi would not be a cake walk. In the meantime the mutiny spread and the mutineers committed even more atrocities thus creating even more personal hatred among the British soldiers who gave zero quarter when they captured mutineers. Atrocity breeds atrocity and while it is not justified it is understandable. General Barnard also fell ill and died of cholera. Command of the relief force then fell to General Thomas Reed himself an invalid. Reed handed over command of the relief force to Colonel Archdale Wilson one of the survivors of the massacre at Meerut. Wilson along with his chief engineering officer Colonel Richard Baird Smith then planned the assault on the city. The relief force was a in a bit of a dilemma. For one, it was very small compared to the strength of the defenders although they had received some reinforcements including the 2nd Gurhka Rifles (recruited in Nepal not India). It’s important to note at this point that while wide-spread most of the Indian Regiments did not join the revolt. Had they, the British most certainly would have been driven out of India. Second, the relief force on the ridge didn’t have any siege artillery and the walls of Delhi were strong. Third, many of the British soldiers were sick as illustrated by the death of their commanders. The climate and disease both contributed to a rather high attrition rate among the effective soldiers. On the other hand Colonel Smith believed that to wait to assault would invite disaster as the mutineers gained even further strength and while help was under way it would take weeks for a relief army from Britain to reach India. A debate ensued between Smith and Wilson as to what to do. Wilson, correctly assessing the situation and judging that an assault would probably fail decided to sit tight. His reasoning was that if they failed it would further encourage mutiny among the rest of the Indian armies. Help did come from an unlikely source, the Punjab, where the British had fought a series of vicious wars with the Sikhs the most martial of the Indian warrior races. The wars ended with much mutual respect between British and Sikhs. The result was that for the time being the Sikhs did not join the mutiny but instead watched to see what would happen. Enter the remarkable John Nicholson. 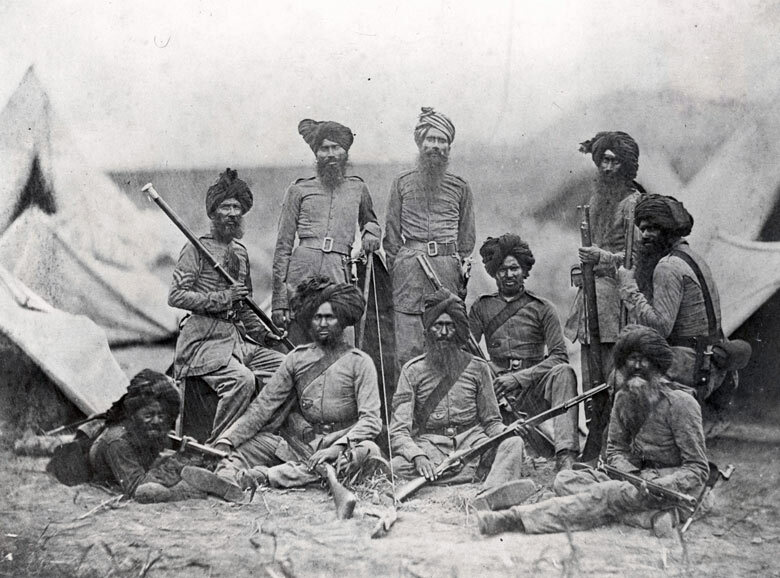 Sikh officers of the 15th Punjab Regiment shortly after the Indian Mutiny. Picture from the UK’s Guardian. The commissioner of the Punjab was Sir John Lawrence. He was assisted by Brigadier-General John Nicholson. Nicholson seems to have been the odd ball eccentric type of English officer like Lawrence of Arabia who simply got things done regardless of obstacles. Nicholson, age 35, was a no-nonsense religious man who Perrett says would have been at home in Cromwell’s Ironside Cavalry. Nicholson had command of a force named the Movable Column. 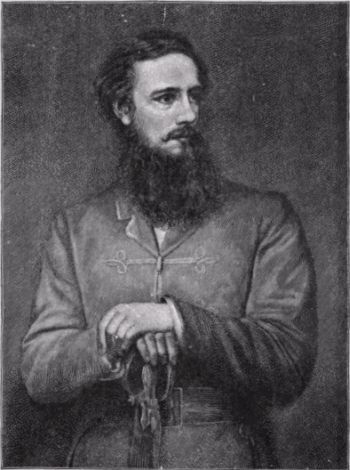 Nicholson was aggressive in hunting down rebel mutineers in the Punjab. When he captured a ringleader the man was tied to the barrel of a cannon and blown apart. This impressed the Sikhs who tended to look down on Sepoys anyway. The Sikhs volunteered to fight in such huge numbers that Lawrence could send Nicholson to reinforce Wilson with three Punjabi Cavalry Regiments, seven Punjabi Infantry Battalions, a siege train drawn by elephants, plus Punjabi sappers and miners. On the way to reinforce Wilson, Nicholson’s Movable Column ran into a force of 6000 mutineers blocking the way. The Movable Column, undeterred by the numbers charged with the bayonet routing the mutineers who lost 800 dead plus all their artillery and baggage. This cost the British 25 killed and 70 wounded, another remarkable victory, but the British were not done yet. Nicholson’s force doubled Wilson’s when the Movable Column arrived at Delhi. Nicholson and Baird pushed for an assault on the city after the siege guns knocked some serious holes in the walls and redoubts. Wilson was still reluctant to assault but eventually agreed with his more aggressive subordinates. It is said that Nicholson would have shot Wilson had he not agreed to assault the city! After breaches were made in the defenses the assault columns moved froward, 5000 men against 30,000 mutineers with the benefits of defense. It was madness but it was successful. Nicholson’s column penetrated well into the city and while trying to take another city gate and rallying his troops for a third assault on it he was mortally wounded and knew it. 66 officers and 1,104 men were either killed or wounded taking the city. That’s well over 20% of the assault force illustrating the fierceness of the fighting. There is more to the story but the storming of Delhi effectively turned the tide as the mutineers became more and more demoralized especially after their leaders were executed by Hodson’s Irregular Horse. Major Hodson, another man of action like Nicholson took a small force of his irregular cavalry and had negotiated the surrender of many of the mutineer leaders who were demoralized by their defeat at Delhi. On the way back to the British\Indian main force Hodson was blocked by an angry mob wanting to continue the fight and liberate their leaders. Hodson was heavily outnumbered and with a carbine shot dead the leaders thus taking the steam out of the mob. He then rejoined the main force unmolested by the mutineers. The event was controversial but given the overall climate of atrocity and revenge Hodson acted to save his command from certain massacre. The overall campaign to retake Delhi had cost the relief force well over 3,800 killed and wounded. About half were Indian soldiers including many Sikhs. A total of 43 Victoria Crosses were awarded. The Victoria Cross is Britain’s highest award for valor. Nicholson, the driving force to assault the city died nine days after the assault. He became known as the Hero of Delhi and according to Perrett even his detractors could not deprive him of the honor. A monument to him was erected in Delhi. It stood there until after Indian Independence in 1947 when the Indian government wanted it demolished. It was instead shipped to Nicholson’s native Northern Ireland where it stands today in the Town of Lisburn. 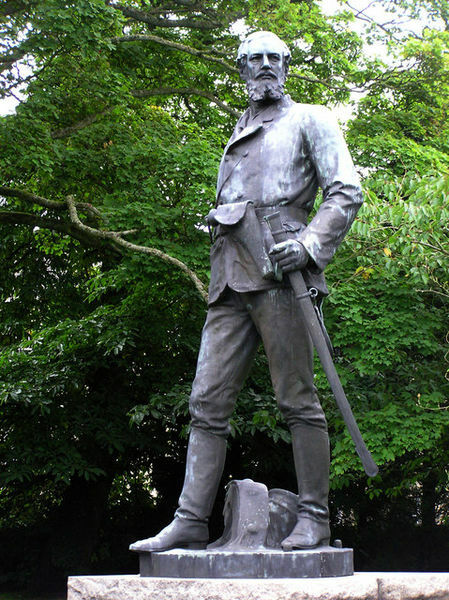 John Nicholson’s Memorial statue in his home town in Northern Ireland. Perrett adds a few paragraphs at the end of this remarkable story pointing out that the mutiny was never a War for Independence as some Indian politicians tried to make it out to be in the decade prior to Indian independence. He cites the fact that half the army that retook Delhi was Indian and that after the mutiny the Indian Army was reorganized while Britain took it over from the East India Company. Over the next 90 + years hundreds of thousands of Indians served the empire loyally and with great honor in two world wars plus many other smaller campaigns under the British flag. 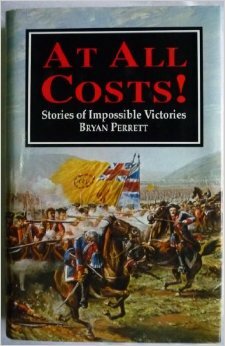 At All Costs-Stories of Impossible Victories by Bryan Perrett, Arms and Armour Press, 1993 Highly recommended by me! I have just come across your blog and have read your latest post with interest. I recently read “The Last Mughal” by William Dalrymple which narrates the siege of Delhi from the viewpoint of its residents, particularly that of Zafar the last Moghul emperor who reluctantly found himself co-opted by the mutineers as a figurehead. He was deposed by the British after they retook the city. Delhi had for centuries been capital of this seemingly refined and cultured Muslim empire, which enjoyed a delicate balance of toleration between Hindus and Muslims, though the emperor had yielded effective power to the British by this time. Many Delhi natives of both religions were horrified at its invasion by what they saw as ignorant Sepoys, and endured ill-treatment and atrocities at their hands. The conquering British, of course, dealt out atrocities in full measure upon the mutineers. I shall keep an eye on your blog and have a look at some of the posts you have made on other subjects. Thanks Russell for stopping by and the commentary. I have an interest in the Empire and confess to being a bit an an Anglophile although I do not grasp many Americans fascination with the Royals 😉 I admire your efforts at self-publishing and wish you well.